The Incredible Hulk Fruit Machine Review - Casino Answers! 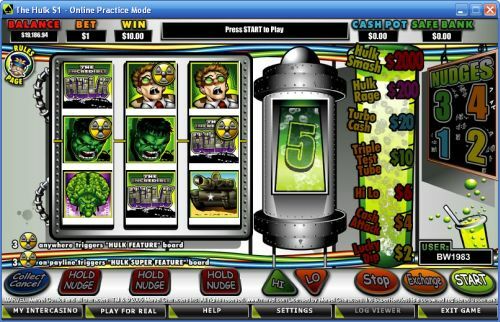 The Hulk is a 3-reel, 1-line fruit machine developed by Cryptologic, featuring a nudge feature, a hold feature, a cash ladder, a gamble feature and two bonus games. You can play The Hulk video slot at [Americans: Unfortunately due to legal restrictions you are unable to play at any of the online casinos this game is at. We recommend you trying playing the unique slots at Win A Day Casino instead.]. The Hulk slot machine is available in three different bets – $0.50, $1 and $5. You will have to select one before entering the slot game. To start playing, all you have to do is hit the “Start” button. If you hit 3 symbols on the center payline, you will win a prize. You will have the chance of collecting that prize by hitting the blue “Collect” button at the bottom left or you will to gamble it, which will be covered later on in this review. The highest paying symbol on The Hulk fruit machine is the Incredible Hulk logo symbol. If you hit 3 of these symbols on the center payline, you will win the 2000X top jackpot. On the $0.50 coin value, you will win $1000; in the $1 game, you will win $2000; on the $5 bet, you will win $10,000. You can win the top jackpot on The Hulk online slot by playing it at [Americans: Unfortunately due to legal restrictions you are unable to play at any of the online casinos this game is at. We recommend you trying playing the unique slots at Win A Day Casino instead.]! There are 9 winning combinations on The Hulk fruit machine. The complete payout schedule is as follows (payouts in parenthesis): 1 Tank symbol (1), 2 Tank symbols (2), 3 Tank symbols (4), any 3 symbol combination of Bruce/Abomination/Leader (4), 3 Abomination symbols (6), 3 Leader symbols (10), 3 Bruce Banner symbols (20), 3 Hulk symbols (200) and 3 Incredible Hulk Logo symbols (2000). As you can expect from a fruit machine, The Hulk fruit machine offers a nudge feature. The nudge feature is activated at random and causes the “Nudge” buttons below the reels to flash. You can win up to 4 nudges on any spin on The Hulk fruit machine. Nudges will allow you the bump a reel down one position. If a nudge causes a win, all remaining nudges will be lost and the win sequence will begin. Another regular feature on fruit machines that is also on The Hulk fruit machine is the hold feature. The feature is activated randomly and causes the “Hold” buttons to flash. Using the hold feature, you can hold the reels you want to keep in place while spinning the remaining reels. Any win you spin in the regular slot game will be displayed on the Radioactive Cash Ladder. To climb the Radioactive Cash Ladder successfully, you must guess whether or not the next number The Hulk is holding will be higher or lower than the current one. If you guess correctly, you will move up one rung of the Radioactive Cash Ladder. If you guess incorrectly, you will lose your winnings. You can collect your winnings by hitting the “Collect” button or you can trade your winnings in to play the bonus feature. If you successfully gamble up to the Jackpot level on the Radioactive Cash Ladder, you will automatically win the jackpot and collect your winnings. Any prize on the Radioactive Cash Ladder can be gambled by using the Hi/Lo feature. Select “Hi” or “Lo” if you think the next number will be higher or lower than the current number shown. If you are successful, you will move up one rung on the Radioactive Cash Ladder. If you are not, you will lose your winings. You can use the Hi/Lo feature until you decide to Collect or Exchange or if you lose your winnings. The Hulk feature board can be triggered when 3 symbols with Radioactive symbols on top of them appear anywhere on the reels. You can also exchange your winnings in order to gain entry to The Hulk feature board. To play the Hulk feature board, simply hit the “Start” button and you will get to move the number of spaces shown. Depending on what space you land on, you will activate different features. During the game, you can always use the Hi/Lo feature to move up the Radioactive Cash Ladder. To accept your winnings and exit the Hulk feature board, hit the “Collect” button. All symbols pay left to right in consecutive order only. Only the center line counts towards the Radioactive Cash Ladder. Wins are paid in accordance with the Radioactive Cash Ladder. Highest win only on the payline will be awarded. The Hulk is an amazing fruit machine. If you are looking for something easy or simple, this is not it. There is so much going on in The Hulk fruit machine that it will blow your mind with all of the insanity. If you’re able to wrap your head around it (we have done our best to explain most of it in this review in the best way possible), The Hulk is definitely recommended, especially for comic book fans. You can play The Hulk fruit machine when you sign up and make a deposit at [Americans: Unfortunately due to legal restrictions you are unable to play at any of the online casinos this game is at. We recommend you trying playing the unique slots at Win A Day Casino instead.]! Can players from the USA play The Hulk fruit machine for real money? Unfortunately, players from the United States of America cannot play The Hulk fruit machine for real money at this time. For some excellent alternatives, we recommend playing the iSlots at Bovada. Where can I find more comic-themed slot machines? If you’re a comic book nerd, you can read about all of the different Marvel and DC Comic Slots in our Marvel & DC Comics Slot Machine Guide, including two other Incredible Hulk slot games. Can I read more fruit machine reviews? You can find all of our fruit machine reviews in our list of all online fruit machines. Where can I play a Flash game of the Hulk fruit machine for free? You can play a Flash game of the Hulk fruit machine for real money only at [Americans: Unfortunately due to legal restrictions you are unable to play at any of the online casinos this game is at. We recommend you trying playing the unique slots at Win A Day Casino instead.]. If you experience any difficulties with the Instant Play casino software, make sure you have the latest version of Adobe Flash Player installed.